Parkrun Frimley Lodge saw the biggest number of SJs in action with sixteen running. Neil Praine logged yet another PB as he just gets faster and faster in 2017. Neil finished in 9th position overall with a superb time of 19:25. Just over a minute later Max Woods warmed up for the North Wessex Downs Marathon the day after and Phillipa Francis also bagged a PB with her new best being 25:25. Royston Crandley recorded a seasons best with 23:24. At Bracknell eight members were in action out of 350 total runners with Richard Johnson first SJ home in a cracking time of 20:44, his best on the redesigned Bracknell course. Charlie St Aubyn was next for the club with 23:29 which is also his best of 2017. Over at Rushmoor exactly the same number of runners at Bracknell started; 350 participants and of the quartet of SJs, Helen Vizard was first to finish in 24:01. Paul Vine was next 27 seconds later, with Nigel Evans just 13 seconds further back. Tight racing in the sunshine. Amazingly no Parkrun tourism this week – why travel when the weather is so good at home! Sticking with the shorter distances, Sunday saw the first of the Decathlon 5km Run Series events (although they seemed to have lost about 300m in the last couple of kilometres) and there was a huge SJ turnout with many disguised in ill-fitting fluro yellow Decathlon T Shirts. It was a great event that looped around the Farnborough Airport paths and roads, starting and finishing outside the Village Hotel. The sun was already melting the tarmac but it didn’t stop Gavin Loader taking 3rd place in under 18 minutes. Another 30ish members also completed so great running everyone. 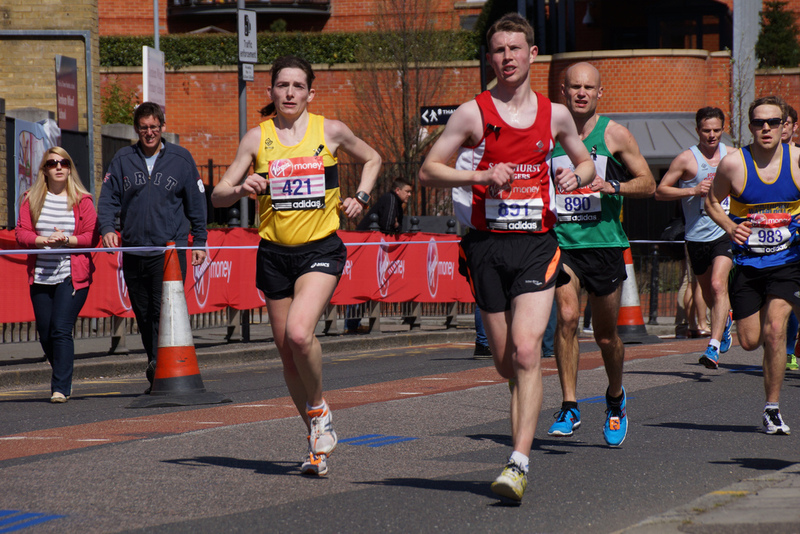 Stepping up the distance, the Brighton Marathon was the biggie with five members in action on the south coast. Completing her 5th run at the event Lisa Hale showed the composure needed to perfectly pace her run and consistency saw her record a chip time of 3:25:08. Next was Phil Guy resisting the debilitating heat to finish in 3:28:09, then Erol Ali in 3:49:58 and Sharon Burfield with a superb debut in 3:53:59. The conditions weren’t kind to Jim Laidlaw but he battled courageously to finish in 4:04:14, followed soon after by Alison Jones in 4:06:10. Zerrin Selen completed her second marathon in a week in 6:05:22. Awesome running everyone in really challenging temperatures! Further north at the Sheffield Half Marathon Patrick Denston ran strongly to record 2:03:21 on a pretty challenging course with more than a few hills! This week Graham Meek repeated his win on the Strava leaderboard with a huge total of 110.6km! John King grabbed 2nd with 98.8km and Lisa Hale the bronze medal this week with 70.7km. Sixty-two members logged runs this week. To take part in this just create a free Strava account and link it to the club in your profile. Tuesday: Multiple groups running on Tuesday from Sandhurst Memorial Park this week plus the interval session meeting at The Tythings in Yateley at 8pm will be the Chinese Hill Session: 2 x 5 minutes, 2 x 4 minutes, 2 x 3 minutes, 2 x 2 minutes, 2 x 1 minute. 30 seconds recovery between reps and then 1 minute between sets. Thursday: This week the threshold/improvers run will be on the Coat Hanger route, don’t forget your headtorch and high viz as it’s still dark out there after 8pm. Friday: There is no Track this week as it will be Good Friday. Back to normal on Friday 21st April..
← Max Woods keeps seeking out those magical yet challenging events – how about a trail marathon on the North Wessex Downs?